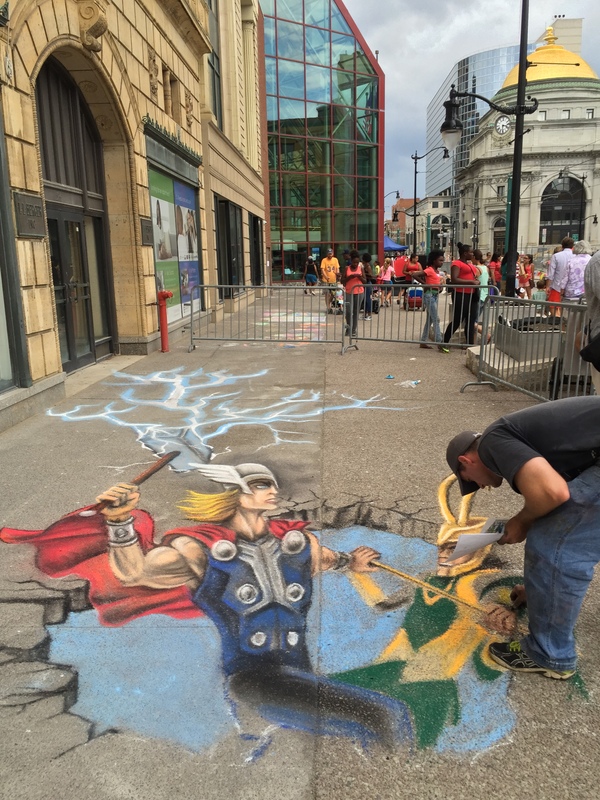 Chalkfest on the 500 Block of Main Street. An annual festival called Chalkfest was held on my block this past weekend. 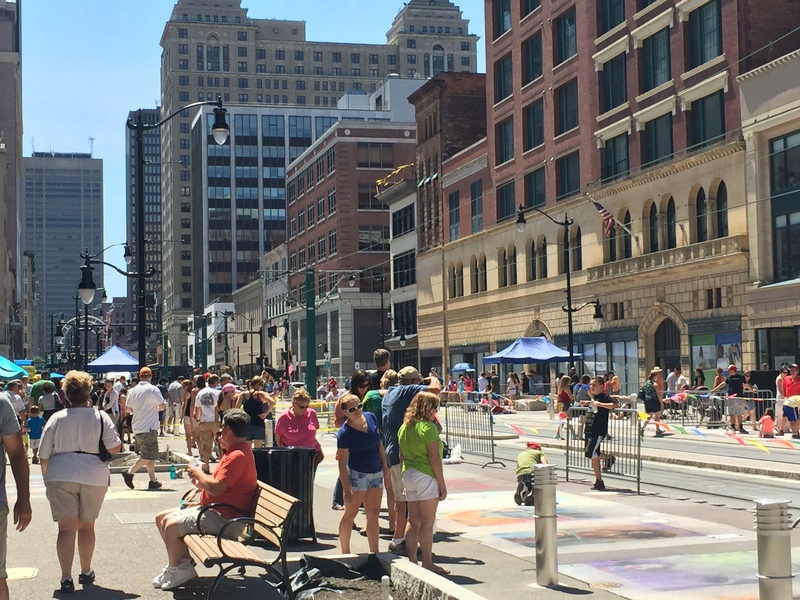 With construction almost complete finally, hundreds of artists and families descended on the 500 Block of Main Street - showing what activity on our street could look like. This is Chalkfest's fourth year, although last year it had to be held on a different street because of the construction. Having our block alive and active from noon-6PM on a Saturday and Sunday reminded me what a real urban neighborhood can be. A DJ provided music and talk; vendors sold food and crafts; local restaurants opened on the weekend when they're normally closed. People who rarely come downtown, ventured down and spent the day with their family. Residents had something to look at and even my cats sat by the windows both days enamored with the activity. And we residents had something to participate in and walk to. 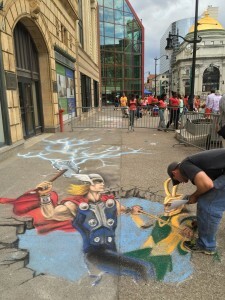 A professional artist puts the finishing touches on his rendition of The Avengers with Thor and Loki outside my building. The best thing I heard, when I asked a woman and her two children settled in front of my door drawing with chalk, if they could move aside so I could open my door, "People live here?" "Yes," I said. "Look at kids, this is a residence! the mom said, "People actually live downtown!" Yes, we do! Reactivating Downtown If you have read my blogs over the past few years you will recall that being an urban pioneer in a downtown under construction has not been the easiest thing at this point in my life/career. Having done this in SoHo in the early 90s, I was not quite prepared to do it again. But as the reconstruction of Main Street and the lightrail is almost complete, excitement about the restaurants and retail that will soon open is almost palpable. Restaurants and retail are needed. But so are services like dry cleaners, safe pharmacies and of course, a real grocery store. Proposals were recently received for a new building with a grocery store about two blocks from me. Granted it will be at least two years before that would open, but it does give us hope. 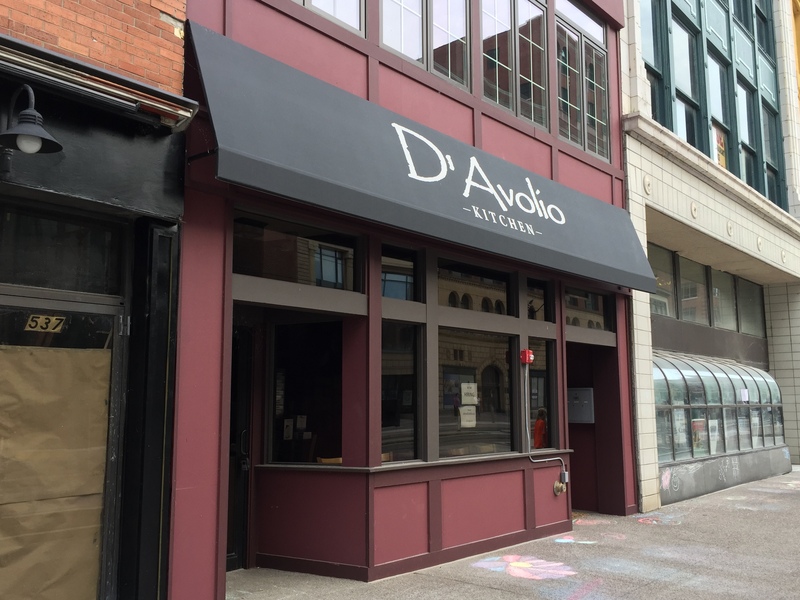 D'Avolio's, a new restaurant, is expected to open across the street from me next week. 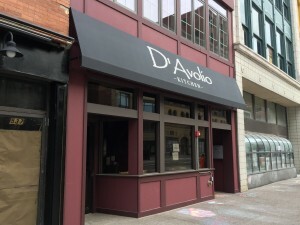 In the past year about ten restaurants have opened or will open within a three block radius of Buffalo's infamous 500 Block (where I live). A new brewery has opened. Several new high end hotels have opened. For decades, this block, which used to be the center of Buffalo's wonderful downtown, has been pointed to as an example of urban blight and urban flight. I chose to live here because I was able to get a brand new work/live loft in a century-old building. I knew it would be years before it was active again, but I didn't really realize what that would mean for actually living here until I was living here. Now that I've braved two years of construction beneath my windows, I feel committed to trying to stay and enjoy the rewards. Big Ditch Brewing Company opened in a reused warehouse two blocks from me. But, life can't be a festival all the time. I was walking around downtown from 5:30-6:30 on Sunday night. Chalkfest ended at 6. By 6:10, downtown was a desert again. Beside the Hyatt, only one other restaurant was open. 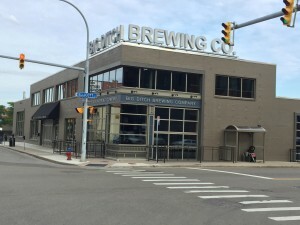 Not even the new brewery was open. I did a loop around downtown and I must say I did not feel comfortable. Festivals and new restaurants are a start for sure. So I keep my fingers crossed that once the construction equipment is gone, restaurants will stay open past 3PM and on weekends, and more people beyond me will be roaming around downtown. If you would like to see more photos of Chalkfest and the art, please click here for Chalkfest. And if you’d like to “subscribe” or follow my blog, True Green Cities, please sign up through the “Subscribe” button at the bottom left of this page. You’ll receive a daily recap when new blogs are posted. Or Sign up for the Feed.